To The Remnant: Why did God Kill Moroni? This verse speaks of God sending blessings of sunshine and rain on both the just and unjust. It doesn't speak to God directly attacking the righteous. Interestingly, the Nauvoo temple was struck by lightning and set on fire just after the twelve prayed for its protection. The attic area where the endowments were performed was badly damaged. Blessing our enemies is a doctrine given by Jesus to show us how to be godly. But that doesn't mean God isn't involved, doesn't have something to say or prophecies to fulfill. Then my anger shall be kindled against them in that day, and I will forsake them, and I will hide my face from them, and they shall be devoured, and many evils and troubles shall befall them; so that they will say in that day, Are not these evils come upon us, because our God is not among us? And I will surely hide my face in that day for all the evils which they shall have wrought, in that they are turned unto other gods. Therefore I write this song for you, and teach it to the children of Zion: I will put it in their mouths, that this song may be a witness for me against the children of Zion. Great information, and of course the cowardly TBM has to hide under the name anonymous. I am surprised God did not just blow the entire statue of the temple due to the money-changing nature of today's corporate church. Keep up the great work. And "John Peterson" is just generic enough to be, essentially, anonymous. Do Ad Hominem attacks actually address any issue? The physics involved with this sign argue against it being an unfortunate random fluke of nature. The designers of the statue expected it to get hit by lightning and included a lightning rod extending up through the good Moroni’s noggin to ground the blasts that come his way. How would a random electrical discharge neatly sidestep the imperative for lightning to seek the highest point to complete the circuit? It’s no surprise that the statue took a beating. A typical lightning strike releases roughly 10 billion watts of energy. (http://www.windpowerengineering.com/featured/business-news-projects/how-much-power-in-a-bolt-of-lightning/) The actual Moroni is probably having a good chuckle over the matter this morning. Now we have a defender of the institution who seems to have the spiritual gift of mind-reading. I hope the fool catcher has the week off. I've recently been following a mostly political, but sometimes spiritual, website put up by a Russian Orthodox former military analyst, (who opposes the secret combinations described in Ether 8, though he probably knows nothing of the Book of Mormon or Ether 8; he comes to his conclusions from his life experience in Military Intelligence and Orthodox Christianity), and how he has a picture of a typical Orthodox Icon on his website, and I thought of "Graven Images", and how we LDS have our own graven images to include all of the statues of Moroni as well as the Christus on Temple Square; therefore, seeing the news of this lightning strike is especially striking (pun not intended) to me. He recently published an article bewailing the apostasy of Christianity in general and Orthodoxy in particular (http://thesaker.is/a-negative-view-of-christianity-and-religion-in-general/) which,if most LDS were to encounter, would constitute "confirmation bias" of the traditional LDS teachings of the "Great Apostasy", yet how many of us LDS (TBM or Remnant or "New Order Mormon" or whatever else) would recognize our own apostasy and straying. I heard that something similar happened to the Payson temple Moroni statue this spring. 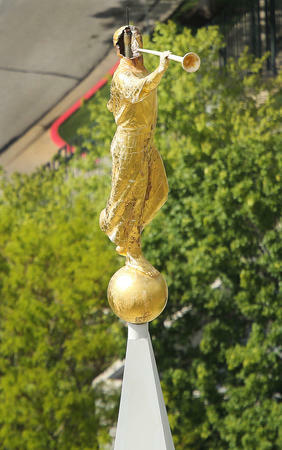 In our stake conference last Sunday (May 15, 2016), the temple president's wife spoke about the head of the statue Moroni being blown off by wind and rain. Several patrons noticed it, and it was brought to her attention and the attention of the grounds keeper. She drove around and found Moroni's head laying on the side of a street close by. Interesting! I hope you see this. I believe we're in the same stake. My stake president is a new man. What is your bishop's last name? My first reaction was exactly what you're saying here. The funny thing is, I kind of talked myself out of it because I figured it was plausible that it was an accident, but it sure did seem coincidental. Funny how, as human beings, we rationalize the power of God when it seems too fantastic. Adrian, thanks for this post. I'm grinning ear to ear. For the first time, I'm thinking to myself, "This is going to be fun to watch." Say there's something to this: that this was God getting our attention. Jesus visits Louis, the Church excommunicates Louis and then sends a representative to his ward (where he could have been still attending) and, instead of sending a message of love and welcoming back, issues a warning for the people to stay away from him (I'm assuming a lot here - not hearing the message myself). I can almost see God thinking, "Oh yeah? Want to see what happens when you mess with my friends? Want to see what I can do? This wasn't even hard. I didn't even break a sweat." OK, I know he didn't think any of that. Just a bit of artistic license. BTW, any word on how things went at baptism even in Denver on Sunday? Why would you say it's fun? What pleasure could you possibly derive from what is to come? So that they'll get their just desserts? Surely as it hits their house, it will hit yours. We should pray mercy and time for them, and for us. When any people becomes desolate of the spirit, Heaven help us all. 14000feet that was my exact response. I laughed so hard. Poor fiberglass Moroni! Our Lord is so gentle and patient. So kind and loving, yet I could almost see him finding this funny as well. Like "grab the popcorn, lemme show you what I can do with such precision..." We have been given so many signs these past months and years, and despite our stubbornness, forgetfulness, and slothfulness, He is ever patient. This could've been a much uglier storm, but it wasn't. Those with ears to hear will hear, and surely He won't give up on encouraging them along. Thanks Adrian for this post. I was completely unawares of the symbolism and appreciate the connections being shared. God patiently watches much more important events than Louis's excommunication without sending accompanying signs of his displeasure. Maybe this is a sign, but I think your analysis is a bit melodramatic. Now, if the stake president got struck by lightning on his way out of the excommunication, that would be fitting of this analysisite, and might strike some fear into these folks. I r3ally doubt there will be much warning besides the scriptures and inspired men before a real calamity hits the heart of the lds people. By then it will be too late for most of them. It's a shame. I liked that House of the President. Good grief. This is stupid. Strange place to be wasting your time, then. ...which is why the lightning rod is part of the design. So what's the explanation of lighting hitting the Oquirrh temple in 2009? Is the God of heaven and earth this petty? As I pointed out in the post, "When other temples have been hit by lightning in the past, I don’t recall ever seeing Moroni blown to pieces." Of course it could just be a meaningless coincidence as to timing, location, degree of destruction, and surrounding events. Or, it could be a sign of God's hand. The test is ours. God's signs are almost always easy to dismiss as natural events, coincidence and so forth. And yet, those who are watching for them can recognize them. D&C 45:39 And it shall come to pass that he that feareth me shall be looking forth for the great day of the Lord to come, even for the signs of the coming of the Son of Man. Yep a test. If you don't think this is a Naegle strike, well that's a check against you on the other side. Of course, if you are righteous enough, you recognize the obvious, the implication being that the rest of us just don't get it. A sifting on a higher level perhaps. Manipulative fear based theology strikes again. I suppose every movement needs its "faith-promoting rumor" narrative. Will this be added to the official history and be taught for generations? Adrian’s belief that the devastating lightning strike to the statue of Moroni was a sign from God as opposed to your belief that is was not has me intrigued, SB. The scriptures speak of God providing signs in the heavens and in the earth in the last days. How do we know when there is a divine message in the catastrophes of nature? It seems like the only way we would recognize a sign as anything other than a one-in-a-billion lightning strike or an exceptional earthquake is through the spirit. I don’t find your accusation that Adrian knows something that the rest of us don’t persuasive. Persuade him back! Don’t accuse him of the only means whereby we’ll ever know if something is a sign from God. It’s entirely possible that he has concocted a provocative urban legend around the decimation of the statue of Moroni atop the temple nearest the LDS chapel where Louis Naegle was thrown out in a act of dominion and defiance against God—but what if he’s right? The only thing crazier than him being wrong is him being right. We don’t have a guide book for these things. If the temple had been destroyed would it be easier to call it a sign? If Bountiful had been submerged under 200 feet of water would it be easier to call it a sign? There is little room in our science-based society for divine signs but then again, God’s thoughts and ways are not our thoughts and ways. If God is trying to talk to us through signs I for one would like to recognize them as such. IDK, Lightning hit a very tall object gilded with metal and with a lightning rod built into it. Lightning tends to do that. Can you tell me what these were signs of? And this really wasn't that surgical. If it were surgical, the bolt would have bypassed the tallest, metal guilded structure and hit the stake presidents car, or maybe the stake president himself. Now that would have been surgical. Lightning hitting a lightning rod is rather predictable. Or perhaps the lightning rod, as built into the structure, served its purpose by protecting the building and the surrounding inhabitants. OR do we just want these faith promoting rumors for historical narrative? And btw, I'm not intending on accusing Adrian. I like his blog. Let's not revert back to our "LDS-ness" by looking at every disagreement as an accusation. 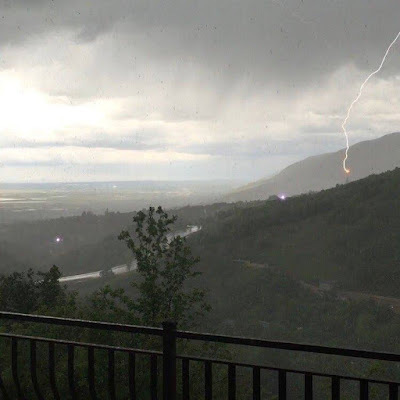 Certainly lightning strikes on the Moroni statues are frequent. Yes, it's metal gilded and very high up there. 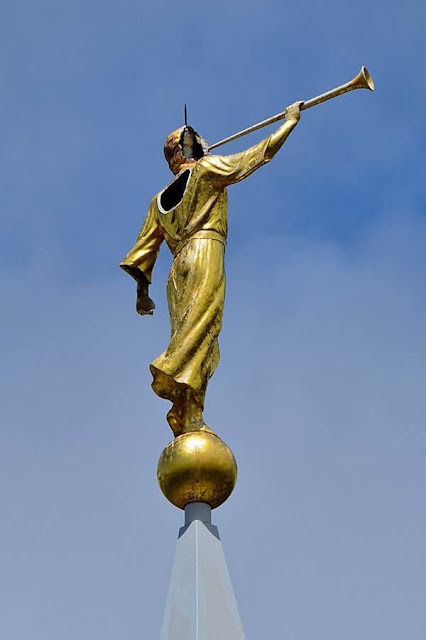 Hence the need for a lightning rod protruding a foot from Moroni’s head to protect the statue, as well as the temple. Nothing surprising there. The face, back and left hand damage indicate a strike with unique explosive force. As much as some might wish to pass this off as routine, it is not. Routine strikes hit the rod and leave no damage. Something was different here. I’ve never seen a Moroni statue blown to pieces. Have you? God has an intended message for each sign given, and thus is the case here, I believe. 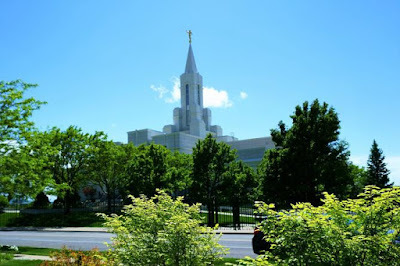 This isn't widely known, but since I was there and watched it, I can attest that it is true: When the tornado struck Salt Lake City in 1999, as it hopped over the temple then moved up the Avenues, a second funnel formed directly over the temple. The whirlwind made it about halfway down before it dissipated. If we look at the pattern and progression (tornado almost reaching Moroni, Moroni being blackened, Moroni's face being melted off) then it makes me think that the next message will not be a sign, it will be the real thing. Will we be ready? And it came to pass on the 10th day of the second month the Monsonites did band together to decry and expel that man who wrote the Forward to a book. Wasn't there also a tornado years ago while the conference center was being built? Right now the church has the attitude of the people in King Noah's day, "We can do no wrong!" and fails to see that dislike and persecution are a call to repent, not a badge of pride. Whether you believe things like the lightning strike are a sign or whether you believe it is not, you must choose or ask God. The point is God has sent a messenger, a servant, an angel and he has declared God's words. No different than Abinadi, no different than Moses. Did the people believe in those days? Only those who had 'ears to hear'. And with the messenger sent today has come the testimony of others bearing witness of God the Father and His Only Begotten Son, even Jesus Christ. God establishes His words by the witness of two or three. There are more bearing witness today. But you "oughta have to choose, or be damned by your ignorance". So "choose you this day whom ye will serve, but as for me and my house we will serve the Lord". We cannot serve two masters. This is my testimony and you can choose to believe or not. I'm no one special. It's not me you should listen to anyway. The Doctrine of Christ, as taught by Christ and His servants, is truth and it is the only doctrine given by the Father through His Son. We must have faith in Christ, repent, be baptized and become as a little child. The Lord has born witness to me by His Holy Spirit that Denver Snuffer is His messenger. It has been burned into my soul. God has born witness that Louis's testimony is truth. It has been burned into my soul as well. The testimony of Keith is truth because it has been witnessed to me by the Spirit. True servants point to Christ and not themselves, all I've seen and heard from these men is that they point to Christ. Why reject them? 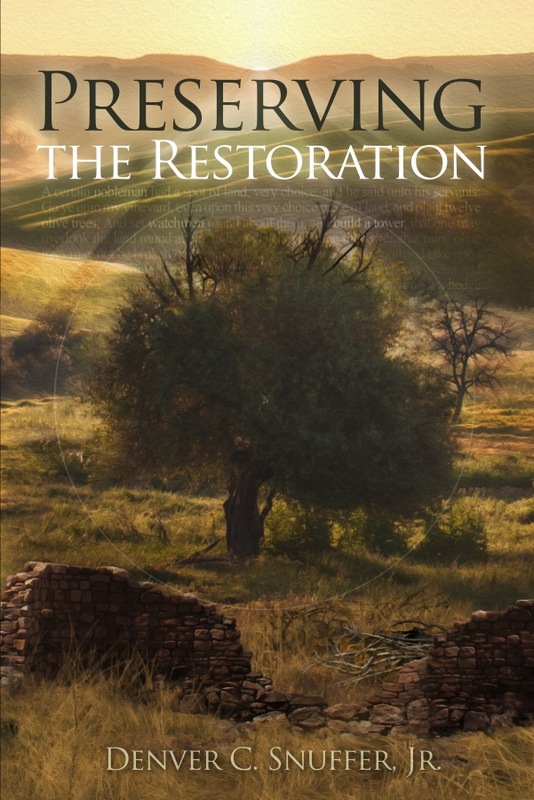 'Preserving the Restoration' is truth and scripture, just as the Book of Mormon and the Lectures of Faith are truth and scripture. God has withdrawn His hand from the LDS church. The leaders are left to kick against the pricks unless they humble themselves and repent. No different for any of us. So simple yet the natural man makes it so hard because we love the carnal and not the spiritual. There aren't coincidences. So is it possible God was sending a warning to those who wish to cast aside His servants? Once again you oughta have to choose and decide for yourself. I wish that we would all repent and turn to face the Lord. Christ is mighty to save. He is coming, we must prepare and hearken, not just listen, to His words. Will you recognize the voice of the Lord in those who have born testimony of Him? Will you & I 'Come unto Christ' and be saved? I truly appreciate the irony in all this as the temples are the greatest abomination of this dispensation with the only authorized practice going on being baptism for the dead, but those are quickly trampled upon by confirming the baptized person as members of the corporation. Everything in the endowment is warned against in the scriptures: Idolatrous blood oaths and secrets signs/tokens are fully associated with secret combinations. While there may in fact be a lot of the philosophies of men in the Endowment, I also have discovered a lot of truth. For example, it is in the Endowment that we get a clear knowledge of who owns and controls the Military-Industrial Complex and those evangelical preachers who support it; "...and buy up armies and navies, and false priests who oppress, ...to rule and reign with blood and horror." Back in April, 1960 General Conference, President David O. McKay made a public announcement, EVERY MEMBER A MISSIONARY. He then announced that the wholly-owned bank (Zions First National) was being sold and going public so it could enter into the Federal Reserve. This action caused the LDS Church to become a "corporation" and no longer a "church". Serious Curses have been happening since that date by the Lord. I experienced a near death experience in October, 1960 at the age of ten near Tucson, Arizona and was in a coma for 78 hours. The Lord confirmed to me how corrupt the "saints" have become (blindly obedient), as warned in 2 Nephi 28:21. Utah has become like the ISIS of the Middle East! I am willing to believe that the lightning strike which damaged the golden idol is a sign of God's displeasure. After all, God controls the elements. Furthermore, if my house was hit by lightning, I can't imagine trying to rationalize that the lightning strike occurred because God was especially pleased with me. However, I think it unlikely that the event was a direct response to the excommunication of a particular person. After all, why would God care if Louis Naegle was excommunicated from a religious organization which God has already rejected as of April 2014? If the church leadership's priesthood has already been brought to an end and God has moved on to a new work outside of the LDS Church, what's the big deal? At this point, being excommunicated from the LDS Church is of no more eternal significance than if you were to have your Costco membership card revoked. But if the Lord can use this "attention getter" to arouse curiosity and point to what He IS currently doing, then it makes perfect sense. What matters is the REASON Louis Naegle was excommunicated, and the book he's associated with. Lots of people are interested in the lightning strike. 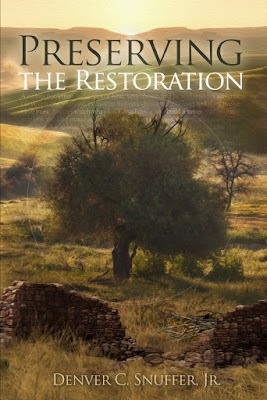 I'm doing my best to direct their curiosity into the Lord's current work to preserve the restoration. Maybe there is some meaning in the appearance left behind by that lightning strike. 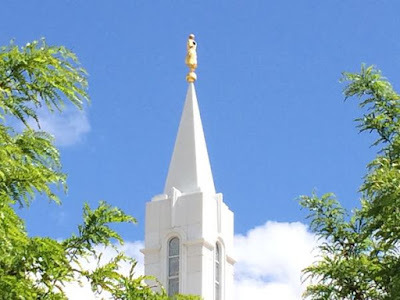 Like with the Oquirrh Mountain Temple, if you look at pictures of it closely, you'll see that only the right arm and the face of that Moroni statue had been blackened. The right arm could be in reference to the strength of the priesthood (right is generally masculine while left is feminine) and the face could be the appearance or the image of the church. To blacken it might be a cursing, since in the bible when Ham's descendants were cursed they were given a skin of blackness. So, in attempting to understand the destruction that took place on the Bountiful Moroni, this was far more than a blackening. This was obliterating certain portions of Moroni's anatomy. First, the crown and back of his head. The crown is generally the connection to God (in regards to Chakras) and the back of the head is generally the portion of the head that stores the brain that houses the occipital lobe, which controls sight. So, maybe he is saying the church has lost its connection (crown) to Heaven and its' ability to see the Light coming from the Lord. As far as the back, it's more at the top of the back near the shoulders. The shoulders are generally representative of responsibility, and so in removing that portion, maybe the Lord is removing the responsibility from the church to save His children. I'm just trying to understand what looks obvious to me that the Lord directed this strike. It missed the actual lightning rod by an inch or two and did obvious destruction to important parts of the statue. What I find very interesting is that our 10-year old, who was about 4 linear miles from the strike (in church in Woods Cross) when it happened, said that it sounded like it came from within the building he was in. He said the sound went on for a few seconds. Then the next morning, on his way to school, he asked his mom (my wife) if there was supposed to be some meaning behind that strike. Like angels falling from heaven or something like that. Deep down we also felt there was something being communicated from God to us, and with Adrian bringing this to our attention, and then us looking more closely at where and what kind of damage was done, I really think that the Lord is speaking loud and clear to those of us with eyes to see and ears to hear. I heard from someone in the church building 1.3 miles away that the boom shook the whole building and the lights flickered. I really appreciate this analysis. I think also worth noting is the time, as numbers often are symbolic. (This is where the skeptics will eye roll and I laugh because I usually err on the side of belief. If I'm wrong I don't mind appearing a fool.) There are numerous books folks of all backgrounds have written to de-code number symbolism. One I enjoy is "Angel Numbers." An interesting line from a post from one author regarding 212, which is the reported time of the strike: "Angel Number 212 may be telling you to look to different ways to enhance your home, garden and surrounds. This includes matters within the house and family arena." http://sacredscribesangelnumbers.blogspot.com/2011/07/angel-number-212.html The quote is a little out of context but those whom signs follow may enjoy sitting with it for a bit. The fact that these incidents are anecdotal and unprovable as far as connecting them to God are concerned is precisely what makes them so effective for producing faith, if and when they really are acts of God. If there is a connection to God, it is unseen, but true. Therefore, there is something new to develop faith in. If there isn’t a connection to God, any conclusions otherwise are vanity. The fact that there are a plethora of heated imaginations concerning all sorts of coincidences and observances about different events allows for opposition to the true anecdotal signs from above. In this case, the facts are clearly documented and the coincidences are plainly listed. The reader has something solid to judge. Comparing this to the stories surrounding Brigham Young’s visage turning into Joseph Smith’s to the point that the whistle in his speech was reproduced, for instance, shows that there is much more reason to believe this recent lightning strike is from God’s will than to believe something divine happened to Brigham Young back while he talked, seeing that one apostle who claimed to have witnessed it was actually traveling abroad at the time, and the rest of the accounts are decades after the event with motive for bias, and with virtually no contemporary journals recording the supposed miracle. The only thing we in Adrian’s camp have that may discredit the sign is a potential general motive for bias. Accuracy is not an issue on the details in this instance. Those factors should be weighed in the balance while studying things out and asking God if it be right. If the sign was a prominent, undeniable miracle, as God has often done throughout history, with no room for doubt, knowledge that it is of God is the only result, and any unbelief after that kind of event will only produce God’s judgment and ire. Sometimes that is what is needed, but not this time. Now, isn’t the above good reasoning to allow for a correct judgement between both possibilities, as opposed to throwing out the believing side just because we’ve been duped too many times in the past? We can be reasonable and believing as well as we can be believing without being superstitious. Only, in true religion, "belief" should be allowed to trump "reason" more often than not, seeing that God's ways are higher than our ways. There is a way to reason correctly, not as the world, but after a sound mind in every form of godliness. Joseph Smith, Peter, Paul, etc, were incredibly reasonable within the correct framework of understanding, and appeared incredibly foolish to all others. Of course the church is cursed! To all those who seek truth, then you know that historically Joseph Smith repented of polygamy (an "abominable thing unto the Lord" and practiced by those who "seek to justify their whoremongers and do not know the scriptures" but misinterpret them for their "carnal desires" (Jacob 2:23-40, D&C 3:1-11) and Masonry (worship Lucifer). This is true as top Mason and British Spy, Albert Pike, stated in "Morals and Dogma" that he "spoke to Lucifer daily"
Truth Seekers also know that historically Brigham Young stole money from the saints, murdered apostates and those who murmured and ordered the Mountain Meadow Massacre"
(Read the 19th century books by Ann Eliza Young - 10th wife to DIVORCE Brigham Young - , Fanny and TBH Stenhouse; "Tell it All" and "Rocky Mountain Saints"; Brigham's Avenging Angels by repenting Danite Warrior, who exposes thief, adulterer, and murderer Brigham Young. Also read "The Confession of John D. Lee". Satanic Mason Brigham used Lee and everyone else. Lee became Young's adopted "son" and Danite and then scapegoat. What about our present-day Money Changers? Research Church Patriarch Joseph F. Smith, put in due to his relatives. He was caught trying to kidnap a little boy from a park restroom in SLC, he was also accused by a Father for what he did to his son, but then conveniently died before court proceedings. Same funny thing happened to Gordon B. Hinky's son-in-law Allan Barnes (mentioned by occupation and relation in the book, "Healing from Sexual Abuse in Mormon Neighborhoods"). Alan Barnes confessed to the FBI that he had bribed Olympic Officials (scholarships and prostitutes), but then conveniently died, before he would have embarrassed Hincky with his nationally-televised court proceedings for the Winter Olympics bribery case. Polygamy and Masonry have never been of God. Neither has theft and murder, which historically has been done by the elite LDS Money Changers, who do not know God. If God did purposely strike the temple and the angel Moroni, it was because neither was true and they were leading the people astray. That big and spacious building and the golden false prophet on top are contrary to the pure and simple Gospel that Christ taught.